If you have suffered serious injuries, lost a loved one or been denied necessary medical care by an HMO or health insurance company or if any other type of insurance claim has been denied, you need an advocate who will stand up for your rights, get to the bottom of what has happened to you and aggressively pursue the results you deserve. 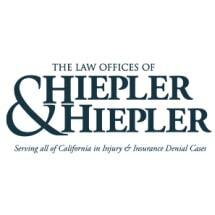 At the law firm of Hiepler & Hiepler, fighting for our clients is not just our job; it is our cause. We know that our clients throughout California, including Ventura County, expect us to make things happen for them, and we are committed to making sure that their voices are heard and their needs are met. Contact us online to talk to one of our experienced personal injury attorneys. At Hiepler & Hiepler, our reputation is built on our results. These include record-setting verdicts and settlements as well as major changes in the ways that insurance companies and other powerful corporations in California and nationwide do business. Our firm was founded in 1994 by the husband-and-wife team of Mark and Michelle Hiepler in response to the tragedy that occurred when Mark Hiepler's sister, Nelene Fox, was diagnosed with breast cancer and denied a potentially life-saving bone marrow transplant by her HMO. Personal injury claims: If you have been seriously injured or have lost a loved one in a car accident, train accident, beach accident or any other incident caused by another's negligence, our personal injury attorneys can help. Insurance and HMO claim denials: If your insurance company or HMO has denied your medical claim or any other type of insurance claim, our lawyers will stand up for your rights and make sure you get what was promised to you by your insurance company. Our record in these areas has attracted substantial media attention. Attorney Mark Hiepler — named by the National Law Journal as one of the 100 most influential lawyers in America — is frequently featured in the national media as an advocate for the injured and wronged. More recently, we have taken up the claims of more than a dozen clients who were injured or lost loved ones in the 2008 Chatsworth train collision, not only helping them pursue fair and appropriate money damages but also arranging for several of them to testify before Congress.